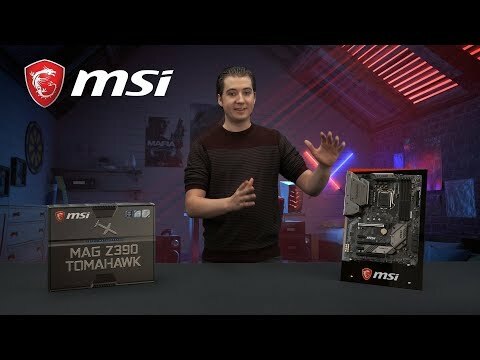 BUILT FOR CONTENT CREATORS AND PROFESSIONALSThe MSI Z390 Tomahawk is a well-equipped ATX motherboard formed from the Intel Z390 chipset. Featuring heavy plated heat sinks and fierce looks, MSI ARSENAL GAMING motherboards are packed with gaming features for a refined gaming experience. All that gaming tech is backed up by a reinforced structure and heavily tested components to ensure long-lasting, high-quality performance. Get More Performance Gaming enthusiasts are always looking for more performance to get the ultimate experience. Using multiple graphics cards is a great way to find out just how good it gets. 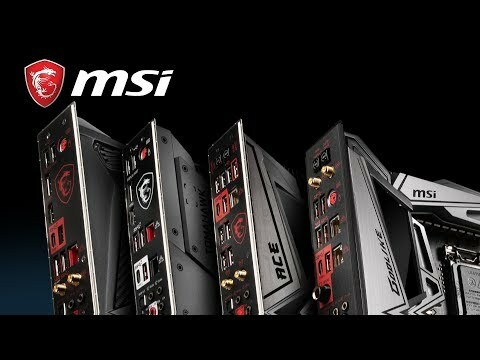 MSI Gaming motherboards fully support multi GPU technologies and have optimal PCI-E slot placement for the best thermal performance. Supporting the latest display connectors for new technologies (OLED, HDR) and legacy connectors for beamers, MSI motherboards are designed to make life easier for any professional user. Overclock Your System in One Second! MSI Game Boost Need more power from your CPU and memory to get more FPS? MSI Game Boost enables one-second overclocking, giving you the performance boost you need. Simply turn the dial or use the Gaming App and your PC gets another adrenalin shot! Speed up with onboard M.2 up to 32Gbps Enjoy a blazing fast system boot up and insanely quick loading of applications and data with MSI motherboards. Delivering speeds up to 32Gb/s per device using Gen3 x4, TWIN Turbo M.2 is over 5 times faster than a regular SATA III connection! Part of the motherboards heatsink design, M.2 Shield FROZR is the next generation M.2 Thermal solution avoiding this by offering the best thermal protection to make sure the SSD maintains maximum performance. EXTRA PROTECTION FOR YOUR PORTS Featuring the pre-installed IO shielding, makes your installation process easier and safer. The patent-pending design protect your IO ports also prevent electrostatic discharge damage, makes your motherboard a strong gaming foundation. MILLIONS OF MARVELOUS COLORS, GREAT SELECTION OF EFFECTSCustomize and set up your own color scheme with MSI Mystic Light utility. Select the available colors from the palette to match your system style. Bored of the same colors? Simply change the complete look of your system in 1 second! You are the artist to create your own unique gaming rig. Done selecting colors? Choose between several LED effects to really make your system come alive and enjoy your personalized design! With the convenience of Mystic Light Sync, you can control RGB LED solutions from other brands, such as CPU coolers, keyboards and mice or RGB system fans. EXTEND YOUR RGB EXPERIENCE MSI's Mystic Light Extension pinheader provides an intuitive way to control additional RGB strips and other RGB peripherals added to a system, without needing a separate RGB controller. By simply connecting any 12V RGB LED strip to the 4-pin Mystic Light Extension RGB-strip header gamers can sync colors to any style they choose. SMARTPHONE & PC CONTROL Create your own colorful masterpiece with ease. The easy to use MYSTIC LIGHT APP is available on PC, phone and tablet. It offers remote control, simply using your smartphone or tablet. Make your PC look and feel brand new with any color you want with just a few clicks! INTELLIGENT NETWORKINGExperience smooth gaming with Dual Intel ® LAN. Dual Intel ® LAN is optimized for both internet and intranet connection, enhancing championship level online and LAN eSports by reducing CPU overhead and offering exceptionally high TCP and UDP throughput. This means your CPU can be used more effectively, giving you more FPS when gaming. lightning-fast transfer speeds! Transfer lots of data, music and movies over USB faster than ever. MSI offers a wide variety of options to connect and boost your USB 3.1 devices, delivering lightning-fast transfer speeds! MSI MAG Z390 TOMAHAWK, Intel Z390, S 1151, DDR4, SATA3, Dual M.2, 2-Way CrossFire, Dual Intel GbE, USB 3.1 Gen2 A+C, ATX is rated 5.0 out of 5 by 1. Rated 5 out of 5 by Morokei05 from Very good motherboard for the price. This motherboard is very good, it has many features such as 2 M.2 slots, RGB (we all want that, don't lie to yourself) and pre-installed I/O shield. This motherboard not only looks great, but it practically works with almost any build colour theme thanks to its grey/black colour scheme. Very happy with this motherboard so far, it's running my i7 9700K perfectly and couldn't be happier.